A few weeks back, I got gifted this No7 goody bag from a good friend of mine and I was very excited to see what was inside! And I am loving everything I have got! No7 is a brand that I don't really buy from as they are only ever in boots and the stands always seem really busy..however I think after discovering this bag, I may be drawn towards them! I haven't really used anything from the bag apart from this lipgloss! 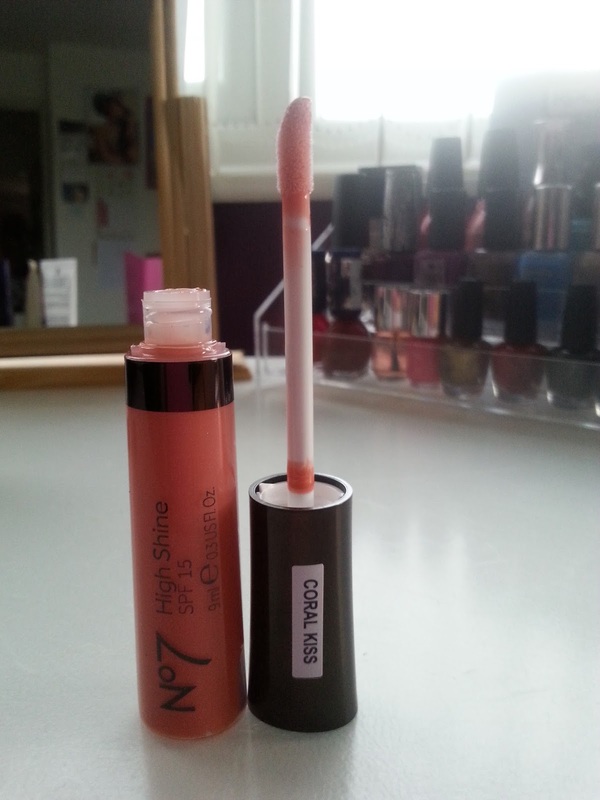 This coral lipgloss, is such a beautiful colour. It is slightly more pink that coral as I would describe it as it isn't as bright. The formula for these high shine lip glosses are amazing, they are so pigmented, glossy and most of all are super soft when on the lips. You can make it look sheer on your lips or even build up the colour if you want something a lot more bold. When I swatched it, it felt really sticky so I tried it on my lips and it wasn't sticky at all! This is available to buy in Boots and there are also so many more shades to choose from!